The 40 miles from Fort Monroe to Jamestown Island is an ideal day trip for adventurers who enjoy the “wind in their face” and the chance to experience wildlife, breathtaking scenery, and over 400 years of history. While a shallop (used by the Captain John Smith expedition) or kayak may be more authentic modes of transportation to reenact early explorations of the James River, a modest-sized powerboat provides a similar experience and allows the modern day explorer the opportunity to do in a few hours what would have taken several days in the 17th century. Departing Fort Monroe at 9 a.m. in our 23-foot center console, my wife and I head west up the James River along the Captain John Smith Chesapeake National Historic Trail (Chesapeake Trail). The initial seven miles of the trip provide excellent views of Norfolk and numerous naval vessels, including aircraft carriers to the south. Soon we approach Newport News Point and the Monitor Merrimack Memorial Bridge Tunnel, the locale of the famous 1862 “Battle of the Ironclads.” Impressive views of Newport News Shipbuilding follow, and not long after we pass beneath the James River Bridge. As we continue northwest at approximately 22 knots, the shoreline gradually becomes less developed. There is a five-mile stretch of river adjacent to Fort Eustis and Mulberry Island that is particularly pristine. Inhabited by American Indians for thousands of years prior to European colonization, Mulberry Island features a thick evergreen forest and abundant wildlife. We continue on west of Fort Eustis and parallel to several large ships moored in the middle of the river. The James River Reserve Fleet, locally known as the “Ghost Fleet,” is a collection of older merchant vessels preserved in case of a national emergency. Once incorporating hundreds of vessels, the “Ghost Fleet” now includes only about a dozen ships. The final 12-mile stretch from Fort Eustis to Jamestown is by far the most beautiful. The shoreline is sparsely developed and the river continues to narrow. Be on the lookout for ospreys during the summer months, and bald eagle and migratory birds during the fall and winter. By noon we are approaching Jamestown Island. The river takes a sharp bend and the archeological excavations, Jamestown Church, and the iconic John Smith statue of Historic Jamestown come into view. When observing the island from the water, its strategic value is easily recognizable. Additional opportunities for adventure lie ahead for those who wish to explore Powhatan Creek and the Back River – the bodies of water that separate Jamestown from the mainland. Powhatan Creek and Back River are both navigable, averaging four to six feet in depth. The Back River is particularly serene as it meanders through wetlands behind Jamestown Island, eventually reconnecting with the James River. Almost every time we venture along the Back River, we encounter at least one bald eagle. The Fort Monroe to Jamestown trip is a favorite because there are many historic sites to visit along the way. One of our favorite detours is Smithfield, where there is easy docking and access to the town. Many people think of the Chesapeake Trail as only being accessible to those who have a kayak, canoe, or paddleboard. Not true! 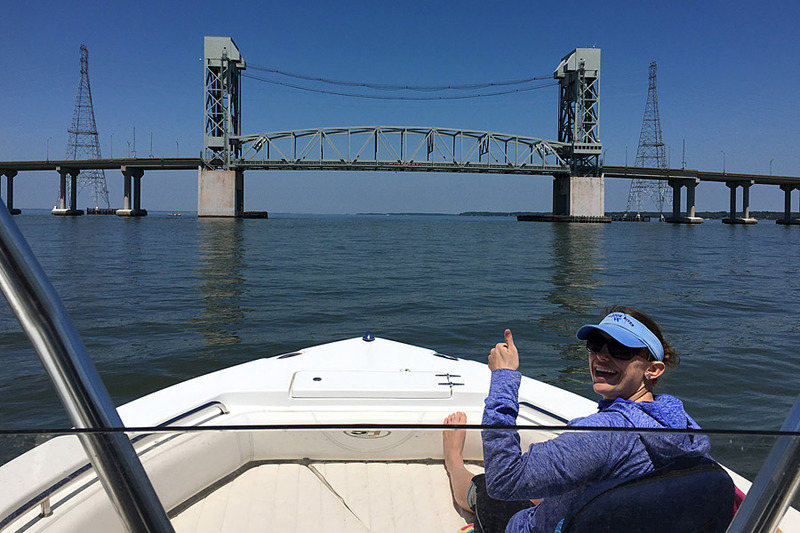 The five-hour roundtrip excursion from Fort Monroe to Jamestown in a powerboat is a life-changing experience and will inspire boaters to look at the Chesapeake Trail in a whole new light. We hope to see you soon on the river! 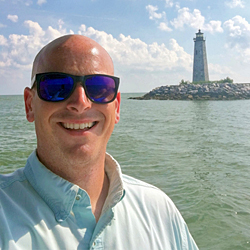 Robert serves as the Vice-President of the Fort Monroe Historical Society, is an American Association of Museums peer reviewer, serves on several board committees of the Virginia Symphony Orchestra, and is a life member of the American Friends of Lafayette. Robert and his wife Katherine, an elementary school educator, reside “on post” at Fort Monroe in quarters originally built in 1875 for Army officers.